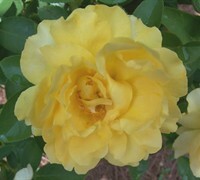 Celebrity chef Julia Child personally chose this Floribunda rose to bear her name! 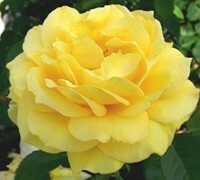 The Julia Child Rose features golden flowers produced in clusters that begin in late spring and repeat all season long. Flowers are medium size, full, (26-40 petals), cup shaped, and globular. The small round bush, has foliage that is bright green and glossy foliage that makes a nice backdrop for the buttery yellow flowers. Free-flowering, Julia Child is known for its old fashioned form and strong, sweet licorice fragrance. Special Notes: Removing faded blooms (deadheading) forces the plant to produce more flowers. Only minimal pruning is needed to maintain its shape.